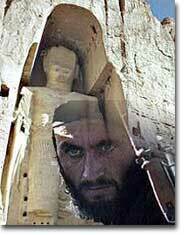 Islamabad, Pakistan -- In 2000, the Taliban destroyed two 5th century AD statues of Buddha in Bamiyan. One was 114 feet tall, the other 163 feet tall. It took 21 days to do the job. The Taliban’s plan to destroy the statues was carefully detailed. The regime commissioned Arab, Sudanese and Bangladeshi demolition experts, as well as Chechen sappers, to do the job. Pakistan’s Al Rasheed Trust published a memorial calendar celebrating the deed. The religion ministry in Islamabad said there was nothing wrong with what the Taliban had done. The world was stunned. The two Buddhas were cut into the Hindukush (Hindu-killer) range which, according to Ibn Battuta, was so named because so many Hindu votaries died trying to reach Bamiyan in ancient times. The great Chinese traveller Hsuan Tsang saw them in 642 AD and noted their brilliant reflection from a distance. The smaller Buddha was Maitreya and the taller one was Rocana. There were 2,000 high caves all around the statues, many of them painted with parables from the life of Buddha like the ones in Dun Huang in China and Ajanta in India. There was a big temple at the feet of the Buddhas which was destroyed during the Muslim rule. The Buddhas themselves were pockmarked with periodic artillery fire from below. Aurangzeb used artillery on them in the 17th century. Earlier, Mahmud of Ghazna, arising from the neighbourhood, had left them intact while destroying the temple of Somnath in Gujarat in India in 1024 AD. Maitreya is based on the root mtr meaning friend. This is the ‘kind’ Buddha whose cult is widespread. Rocan is pronounced rochan and is exactly the Persian word roshan, meaning shining. Many Hindus take the name today and write it Roshan, at times confusing us. It is quite possible that Hindu families have adopted Roshan as a sign of their pluralist beliefs. The Parsis of course take the Persian name, Roshan. Our greatest Muslim squash player was called Roshan Khan. Two great Parsi women have lived in Pakistan. Late Maki Qureshi was an internationally recognised poet. Her polyglot sister Roshan Dhunjibhoy, converted to Buddhism, arose as a broadcaster of note in Germany and ran an NGO in Lahore before settling in Thailand. Roshan’s Parsi parents perhaps never thought that they were naming her after the bigger Buddha of Bamiyan. It seemed Rocana claimed his own, before he was destroyed by the Taliban. Maitreya is the future Buddha, a Buddha who will be reborn in a period of decline to renew the doctrine of the founder of Buddhism. Maitreya is believed to be a bodhisattva, one who refuses entry into nirvana, a transcendent state free from suffering, out of a compassionate desire to help others. At present, he is believed to reside in Tushita Heaven, where he awaits his rebirth. Although various calculations exist, this rebirth is expected to occur in 30,000 years. Maitreya is revered in China, Korea and Japan, which accounted for so much international hatred for the Taliban and Islamabad’s religion ministry. Afghanistan was once a great seat of Buddhist learning. It was the kingdom of the Kushanas, the great Buddhist dynasty which ruled Pakistan’s north-western region too. The Afghan war unleashed the mujahideen on this great country. The great heroes of the Afghan war have sold Afghanistan’s archaeological treasures to private parties in the West. Some items from the Bamiyan site have fallen in the right hands and therefore been saved. If the religious parties come to power in Pakistan, its museums too will be vandalised and sold to buy guns. Pakistan’s ancient history is that of Buddhism, called Gandhara civilisation. The textbooks in Pakistan have already played it down. In a way, we are ready.